only issue is the use of the word "transgendered" rather than "transgender" in the profile of sylvia rivera. otherwise an excellent resource & quick read/reference that everyone should have on hand. Would keep on my shelf as a quick reference to powerful women throughout history. If it doesn't come with a second book, it should. this book, originally a zine, is made up of concise descriptions of revolutionary women. Some are unionists, while others are eco-feminists, anti fascists, education activists, guerillas, authors, anarchists, socialists, and a mixture of many more.the point of the book is to show a global representation of, not perfect women but, women who fought and pioneered for universal rights. The book is an attempt to give female representation in a male dominated field: revoluntionaries. As said, short descriptions but the book also acts as a street level resource, coming with stencils of each women and encouraging readers to turn the stencils into tshirts or posters etc. Not just a book of stencils but also an interesting look into the lives of some fascinating women. I need to read more about all these women! Awesome lecture that gives you some insight to the history that's completely omitted in schools.Enriches knowledge and sparks interest in subject. Made me want to learn more about some of women mentioned there.Great for future reference. It was on hoopla. Hadn't heard of a few of these. Some names to explore. Revolutionary Women is successful in its project of creating images of intriguing women in the fashion of Che Guevara’s iconic stencil while also providing brief biographies. This book has a refreshingly global representation of women from different countries and cultures, and with different revolutionary tactics and philosophies. The biographies include very minimal background information, but such brevity allows the courage of these thirty women to be highlighted regardless of the causes for which they fought. This book introduced me to a great deal of revolutionary women I had never heard of before. I feel so enlightened now having read it. There were alot of women in it I want to read more about and know about their lives more. It really woke me to the power of one woman in this world of so much over population. I think I'll come back to this book time and time again to remind myself just what one single person can achieve. 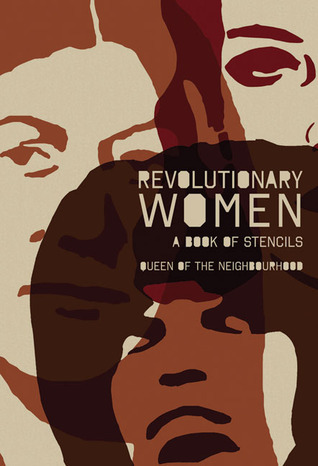 Amazing collection of female revolutionaries from the 19-21st century along with easily reproducible stencils for all your revolutionary graffiti needs. Seriously this is a fantastic overview/who's-who that deserves your attention. A quick and very good read, only a few activists stood out to me, Assata Shakur, Malalai Joya, and Ani Pachen. Very inspiring book, I look forward to diving into the knowledge realm of feminism, womens issues, as well as issues steaming from oppression. Loved this, but was hoping for more robust descriptions. "çiçeği koparabilirsiniz fakat baharın gelişini durduramazsınız"